Cities are seemingly down for this new era of transportation, which entails micromobility services and ride hailing, and operators are increasingly more down to share their data with cities. Now, cities just have to find out what to do with this data and how to extract learnings from it. The platform is designed to enable cities to access vehicle and trip data from shared-mobility operators. City planners can view where people park and ride scooters, for example, to better determine the best place to put scooter parking areas and dedicated lanes. To date, Populus works with Washington, D.C., and cities in the SF Bay Area and Los Angeles regions. 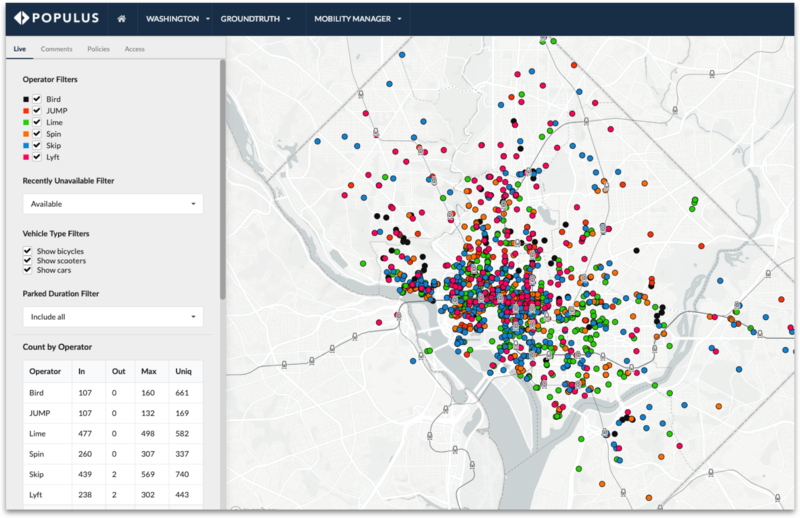 Given that most cities require shared-transportation operators to share data with them, it’s easy for Populus to come in as a third party. Populus also offers real-time data from rideshare companies to inform curbside management and pricing. Back in December, Populus partnered with Lime to facilitate data sharing from its car-share service, LimePod.